he first person to copy Holbein's dance of death was Heinrich Aldegrever — a pupil of Albrecht Dürer. 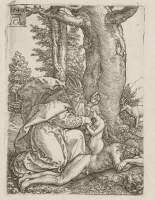 As early as 1540 — only 2 years efter the publishing of Les Simulachres — Aldegrever published his series about the Life of Adam and Eve, where the picture of Eve's creation (to the right) obviously was copied after Holbein. The very next year, in 1541, Aldegrever published a dance of death — Die Macht des Todes — with 8 pictures i.e. 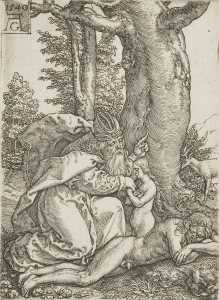 4 scenes from The Old Testament and 4 ecclesiastics. Aldegrever doesn't decidedly copy Holbein, but it is apparent that his dance of death is very much inspired by Holbein. 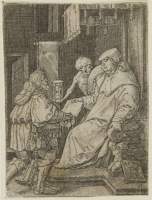 The engravings can be seen in detailed enlargements at the Virtual Copperplate-cabinet (see external link below) The pictures are quite small — less than 7 cm. tall, but full of details. The handcraft is masterly, and it's a pleasure to enjoy the lines in the drawings. The publisher of Eberhard Kieser evidently also liked Aldegrever. 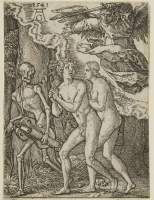 Kieser's version of the dance of death is a close copy of Holbein without many deviations, but in those 8 cases, where he has had a choice between Holbein's original woodcuts and Aldegrever's copies, he has in 7 cases chosen to copy Aldegrever instead of Holbein. Aldegrever can be seen on The Virtual Copperplate-Cabinet. The cabinet has thousands of old prints, which can be seen in razor sharp magnifications. Search for "totentanz" or "aldegrever".